Instructions: 1/2 page, photocopied on both sides. Overall Rating: 9+ - Absolute must for anyone planning to add lights to a model. ^ Fiber optics in action -- Ooooh, pretty lights! There's just something about a model starship that's been lit up. Adding illumination to a model brings it to life and adds a level of realism that just cannot be achieved in any other way. Still, many modelers resist building lighting systems for their projects. There are myriad reasons for this but I think the number one excuse is lack of know-how. And it's easy to see that. Even though it's a relatively simple operation, lighting can be a little intimidating. There's a lot that must go into the planning of even a simple lighting system for a model. There are all sorts of things to consider. How will it be powered? Do I use LEDs or bulbs? Will I have to use a soldering iron to make my connections? These are just a few of the questions you must ask yourself when you design a lighting system for a modeling project. MadMan Lighting, Inc. of Nashua, NH has just made it a heck of a lot easier. They've released a pre-fabricated kit that answers at least some of the questions listed above. The Delux 8 Lighting kit comes packed in the same kind of container that computer memory is sometimes packaged in. 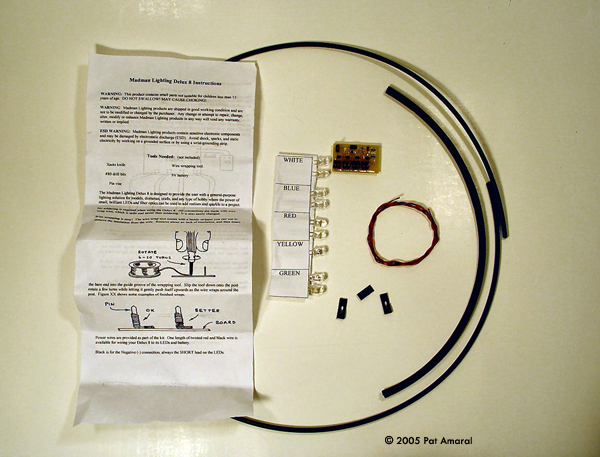 About 3 feet of jacketed optical fiber and about 10 inches of heat shrink tubing are coiled and attached to the outside of the package with tape. Inside, is a tiny (1¼" x ¾" - 32mm x 19mm) LED Driver Board Board (the circuit card that makes up the heart of the system), 9 5mm, water clear, super bright LEDs of various colors ( 2 red, 2 blue, 2 white, 2 green and 1 yellow), 2 lengths of AWG30 wire-wrap hookup wire (about 2 feet each of black and red), and 3 shorting jumpers. A Wire Wrap tool. More on this in a moment. Pin Vise (kind of like a jeweler's screwdriver handle but designed to accept micro-drill bits). A supply of #80 drill bits (for making holes in plastic just big enough to accept a single strand of optical fiber).You'll need a few of these because you will break some in the course of making those holes. A power source. The system is designed to accept 6v to 12v - a 9 volt battery should do nicely. Nine volt batteries connect using a special clip so you'll need one of those too. If you decide to use a wall transformer, for best results, you should use one rated for an output of 9v at 100mA. The kit is designed to be assembled without a soldering iron. Therefore you need to make connections using a technology called wire-wrapping. This is a really easy process that only takes a few minutes to learn. You will need to purchase a wire wrap tool. This is a little device that allows you to make circuit connections by twisting the wire several times around a small metal post. Most have provisions for stripping the wire and removing it from a post as well. I managed to find an inexpensive wire wrap tool at Radio Shack for $6.99 (link below) that will do a fine job. The system is designed so you can connect up to 8 LEDs in different combinations by wire wrapping their leads to selected pairs of terminals on the driver board. The Shorting Jumpers, three of which are included, must be used when only one half of a particular set of terminal pairs is used. There are several ways of doing this and unfortunately the instructions aren't completely clear in this respect (it's the only gripe I have about this kit). To help clarify the use of the jumpers, the drawing below should give you an idea of how some of the several possible configurations can be set up. DO NOT JUMPER BOTH POSITIONS OF ANY OF THE TERMINAL PAIRS AS THIS WILL CAUSE A SHORT WHICH WILL LIKELY DESTROY THE DEVICE. As I stated before, the Delux 8 Lighting Kit includes 9 5mm, water clear, super- bright LEDs of various colors( 2 red, 2 blue, 2 white, 2 green and 1 yellow). Some modelers may wish to replace these with a different selection of colors or LED types. For example, you may want to install 8 LEDs of all one color. Since the system is designed specifically for driving LEDs, the current at all of the outputs is regulated at a constant level (18mA). This is sufficient to drive virtually any type of LED. Another nice feature of the Delux 8 is that you cannot damage the circuit by hooking something up backwards. It simply will not work if you do. The instruction sheet contains clear directions concerning which wires should be connected to which terminals so it’s pretty difficult to get things reversed but it’s nice to know that your money won’t get wasted if you do. While were on the subject of the instruction sheet, there’s a nice description on how to wire wrap with tips on getting it right. By the way, I know that unless you’ve done it before, most modelers aren’t going to have a wire wrap tool in their tool box. Fortunately, they’re inexpensive and easy to find. I found one at radioshack.com that only costs $6.99 plus shipping and will do nicely for a project like this one. 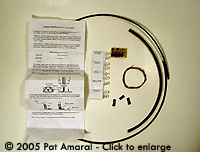 The instruction sheet also has some tips on installing the optical fibers included in the kit. Oddly missing however, are directions for using the heat shrink tubing. Lots of folks are inclined to use a lighter or a candle to heat the tubing to cause it to shrink down over the end of the fibers and LED. This is not only dangerous, but it can also damage the LED and optical fiber. I recommend using either a soldering iron or a heat gun. Just wave either of these near the tubing and it will quickly shrink down without causing harm to the materials inside. They’re still dangerous but not nearly as much as using an open flame. Finally, for the folks who are a little more advanced, there are a couple modifications you can do if you like. Each of the terminal pair sets connects two LEDs in series. The regulated outputs can drive as many as three LEDs in series if the voltage is sufficient (9v should be enough). Also, if the LEDs are too bright or you don’t want them running at full you can cut the longest trace on the back of the Driver Board and solder in a resistor to cut the brightness down. The 18mA output current is limited by a 6.6k resistor on the board. You can cut this in half by adding another 6k resistor across the cut trace. Obviously, you should be pretty good with a soldering iron to attempt this. The traces on the Driver Board are pretty small and fragile. I recommend using a clean and sharp tip on a low wattage (under 30 watts) iron or you run the risk of toasting the board. This lighting kit is a real gem! At last, people who have hesitated to light their projects because either they didn’t know how or didn’t want to take the time to design the circuitry, don’t have any excuses anymore. The Delux 8 is well thought out, easy to use and inexpensive. Whether you’re just starting out with lighting your models or you’re looking for an easy and darn near “plug ‘n play” solution to add to your lighting systems, I highly recommend this kit. Many thanks to MadMan Lighting, Inc. for providing the review samples. Manufacturers and retailers, interested in getting your wares reviewed and publicized on a site averaging 3500+ readers a day? Contact us! This page copyright © 2005 Starship Modeler. First posted on 15 November 2005.